• You can now change font for CD-Menu Creator’s editor. 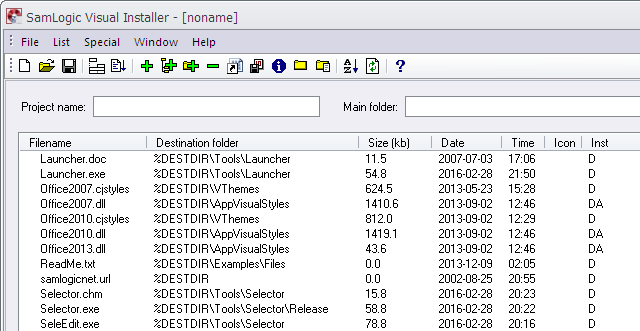 • Creation date of a menu is automatically saved in the Version tab of the editor. • New menu interface examples have been included. A more detailed list with the new features is available on this page. 1. Open your project file or create a new one. 2. In the File list tab, select the file that you want to write-protect. 3. 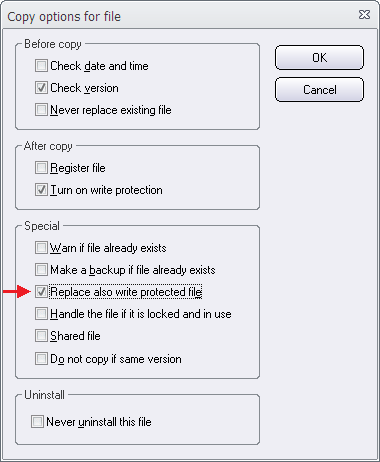 Choose the List – File copy options menu item. When you install a software it can sometimes be useful to remember the installation date. In Visual Installer you can do it by using the %DATE variable, which retrieves the current date from the system during an installation. The contents of the %DATE variable can then be stored in the Registry or in an INI file. 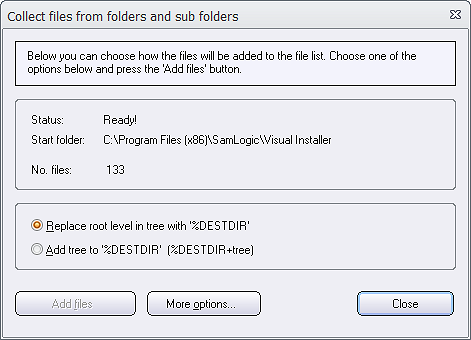 Visual Installer: Does SETPERM change folder permissions also for sub folders? With the SETPERM script command in Visual Installer’s script language you can change permissions for a folder on the user’s hard disk during an installation. But what happen with the sub folders? Are the folder permissions inherited? You can see the current folder path to the right of the Folder field name in the dialog box. In the option frame (above the three buttons) you can choose how the folder structure will be built in Visual Installer’s file list. You can choose between replacing the root level of the folder tree with the %DESTDIR variable, or add the folder tree to the %DESTDIR variable. To return to the file list, just press Close in the dialog box. Instead of collecting the files in a folder tree you can also extract only the folders (directories) of the tree and skip all files. In this blog post we explain how to do this. 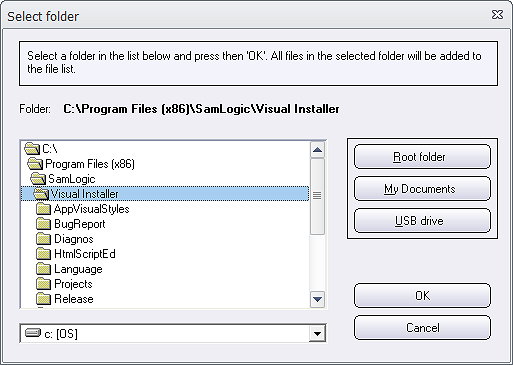 With the Add tree function in Visual Installer you can add a folder structure including files to Visual Installer’s file list in an easy way. 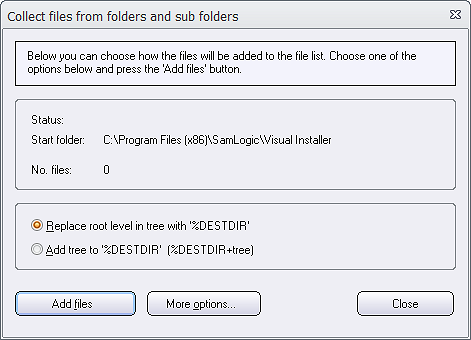 It is also possible to add a folder structure without files to Visual Installer’s file list with the same Add tree function. We will show below how to do this. 1. 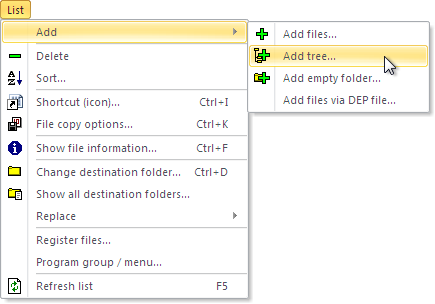 Open the List menu and choose the Add – Add tree menu item. 2. Select a folder in the Select folder dialog box and click OK.
3. Click on the More options button in the Collect files from folders and sub folders dialog box that now appears. 4. Select the Only add folders option in the More options dialog box that now is shown. 6. Now click on the Add folders button to start collecting folder. 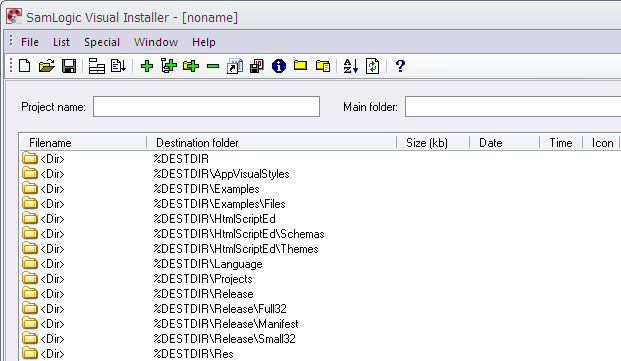 All folders and sub folders in the selected folder (in step 2) will be added to Visual Installer’s file list. The number of collected folders will be displayed after the No. files field name in the dialog box. 7. Click the Close button in the dialog box to return to the file list. If you want to check if Microsoft Office is installed in the end-user’s computer you can use the new IF OFFICEINSTALLED condition that we have added to Visual Installer’s script language. You can also check if Microsoft Office is not installed in the computer in an easy way by using the IF NOT OFFICEINSTALLED condition. There are 32 bit and a 64 bit versions of Microsoft Office available, and if you distribute executable files or components that co-operate with Microsoft Office (for example with Microsoft Excel or Microsoft Access) the bitness of the executable files or components that you install must often be the same as the bitness of the installed Office. To handle this in a smooth way, you can use a new condition in Visual Installer’s scripting language. The name of the new condition is IF OFFICEBIT=?? where ?? can be 32 or 64. 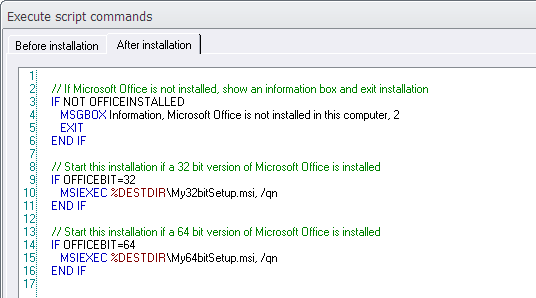 For example IF OFFICEBIT=32, which checks if a 32 bit version of Office is installed. If no Office application is installed in the system, an information message box is shown (line 4) and the installation stops (line 5). When using the script language in Visual Installer, it may sometimes be useful to see in detail what happen when the script lines are executed. To get detailed information about the execution of script commands, you can activate a log function in Visual Installer’s script language. When the log is activated, detailed information about every script line that is executed are stored in a log file. Here you can see the contents of the parameters that are passed to the script commands and see the return value (for example error codes) of every command. If you use variables in the script (for example %DESTDIR) you can see their actual values. If you want to log all lines in the script, you don’t need to turn off the log at the end. It will be turned off automatically after the last executed script line. 2 : File not found! 3 : Path not found! 183 : File already exists! The filename of the log file is Vinstall-Script–Before.log if the script lines are executed in the Before installation tab in the Execute script commands window in Visual Installer, and the filename is Vinstall-Script–After.log if the script lines are executed in the After installation tab in the same window. The filenames can not be changed, but you can change the folder where the log files are stored (as described above). If you have documents (for example PDF or Word documents) that you want to distribute to other people via a CD, DVD or USB flash drive, CD-Menu Creator is the right tool for you. You can create a menu interface very fast and you can have clickable buttons that the end-user click on to open your documents. If you have sensitive documents that you only want some specific persons open and read, you can password protect the access to the documents. You can also have the documents encrypted on the CD, DVD or USB flash drive, so nobody can read them directly on the disc or drive. And if any person copies the documents from the disc / drive to another place, they are unreadable. The documents can only be read via the menu interface and by entering the correct password. The menu interface will ask for a password when the end-user clicks on the button that opens the document. 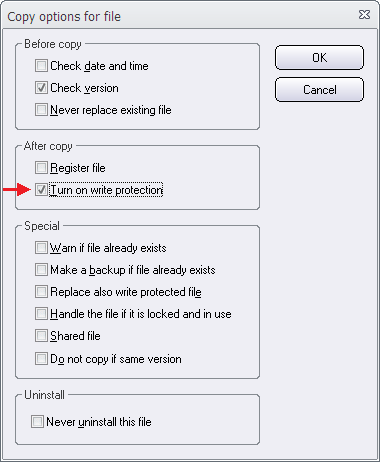 The tip below explains how to password protect a document that is opened via a button in a menu interface that is created with CD-Menu Creator. The document will also be stored encrypted on the disc or drive, and can only be read via the menu interface. 2. Open the Buttons (text) tab in the editor. 3. Click the Add Button button. 4. Enter a button text at Text (button). 5. Select the Show Document command in the Command combobox. 6. Click the “…” button and choose a document (for example a PDF document). 7. Click the Options button in the dialog box. 8. Open the Password tab. 9. Select the Password protect this button option. 10. Enter a password in the Password input box. 11. Select the Encrypt the file linked to the button option. 12. Click OK. And thereafter OK again. 13. Now create your menu! After you have created your menu you can click on the button in the menu interface. A dialog box that asks for a password is now shown. Now enter the password that you entered at step 10 above to open the document. 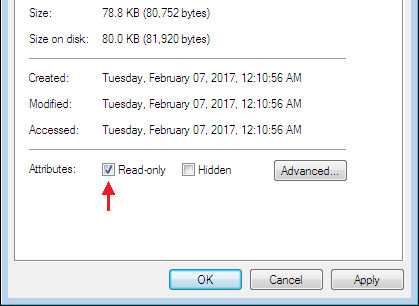 If you enter another text, the document can not be opened. The password and encryption function protects the document, so nobody can open it without the password. But if you also want to assure that nobody can save or print the document via the document viewer that is used to show the document, you must disable these functions in the document viewer or choose a document viewer that does not have this functionality. You can read the documentation to your document viewer/editor to find more information about this. 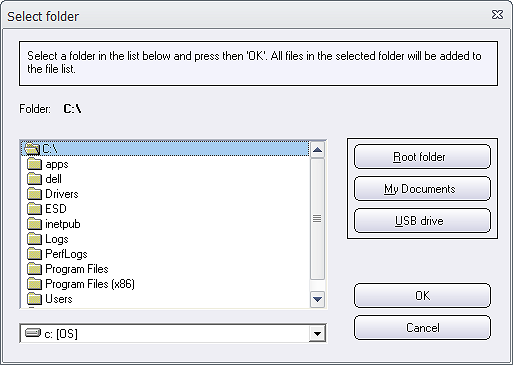 If you distribute a document viewer with your CD, DVD or USB flash drive, you can choose the Run Program command at step 5 above and enter the path to the document viewer in the Filename text box and a path to the document file in the Parameters input box. If needed, you can also enter some switches to the document viewer program in this input box. Instead of using the encryption/decryption function in CD-Menu Creator, you can also use a document viewer that supports encryption and decryption. To have maximum security, this may be a better choice because they are specialized tools, and as a such, the security may be better.